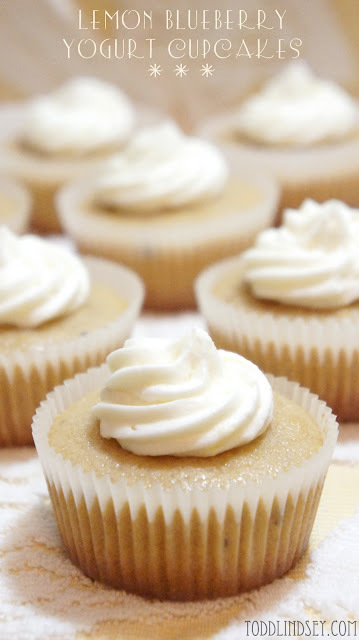 These are one of my favorite cupcakes to make! They are great year-round but are perfect for spring and summer. The batter is yogurt based so the cupcakes always turn out super moist. The fresh lemon zest in the batter and in the buttercream frosting gives the dessert it's lightness. And the best part? This recipe doesn't make a million gazillion cupcakes! It only makes a dozen per batch. Don't worry though- you can double the recipe (or triple it!) if you want... I just would recommend mixing up each batch separate for best results. I love it when recipes don't make a gazillion cupcakes. These sound super tasty. Ahh! I don't know what happened to our last comment! These look amazing and we can't wait to try them!!! Hello Lindsey! Another great recipe! You are one talented baker! Ooooh yummy!! I love that for a hot day. Thanks for sharing the recipe. For the dollhouse concrete- if it's not sticking to the wall it's because it's not wet enough. Maybe you got an old one or one that was open and let the air dry it out too much. Easy fix! Apply the concrete to the house. I usually have the surface I'm working on up and flat. So gravity isn't an issue. I do one side and let it dry then move on to the next. Apply your concrete to a1/4th of the house and dip your spatula in water and spread that on the concrete too. So you are re wetting your concrete as you are spreading it on the house. The main thing is to have the wall flat in front of you. If you work on a vertical surface you are making more work for yourself. I hope this is clear enough. It's hard to explain. But if you still need clarification I'll be happy to explain more. I'm off to bake your cupcakes! Those look and sound amazing!!! I'm saving for someday soon. Thank you. Stopping by from Give Me Goods Linky, I'm your newest follower :). These sound so yummy! I love the combination of lemon and blueberry! YUM! I'm definitely trying this recipe!! I love how good yogurt makes baked goods! These look delicious! THanks for linking up at Printabelle. Ohhhhh! Think I'll make these this weekend when my mother-in-law comes over. They'll go great with a cup of coffee. Sounds like a perfect flavor combination! I'm baking these right now for my women's group meeting. My house smells heavenly!